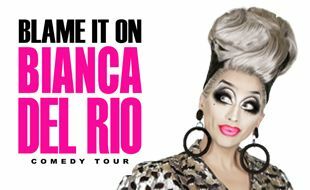 When it comes to insult comics, Bianca is in a class of her own. Fierce, funny, and fabulous—a would-be love child sired by John Waters and birthed by Joan Rivers—Bianca sandblasted her name in the annals of pop culture on RuPaul’s Drag Race. Thanks to her snarky frankness, impeccable comedic timing, and politically incorrect humour, she became the show’s breakout star, winning its sixth season.